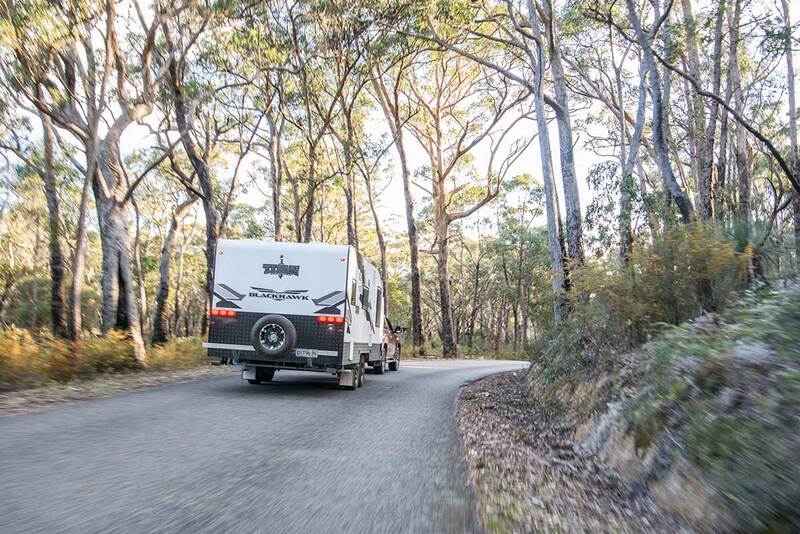 Gallivanting around the Grampians in pursuit of pure pleasure. 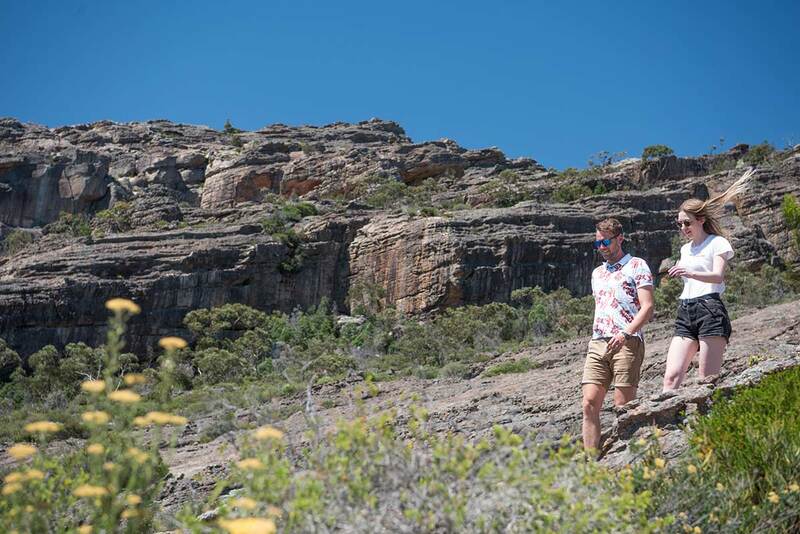 The Grampians has always fascinated me and I regularly travel into its depths but as you’ll find, there is just as much to see and do travelling around the famous ranges. For logistical reasons we started our trip to the north which gave us a chance to discover the great roads that lead into western Victoria. Our steed a brand new Pajero Sport and our home-away-from-home a new Titan Blackhawk 19.6; we would discover the combination a match made in heaven in the long days to come. Close to Horsham, the northern centre of the western Grampians, Mount Arapiles is a 140m tall rock formation that literally juts out between the seemingly endless crops that surround it. More than a marker it teases the tourist to discover what hides beyond the horizon and over the short berms that litter the flats. There is a time and a place for everything, I am told, and if it’s stunning outlooks that you seek, Mount Arapiles during the peak of the canola bloom is one of the best. We timed our trip perhaps a week off as the flowers started to turn but were stunning nonetheless. The contrast of deep, lush greens fenced in all manner and size fields to the almost fluorescent yellow had us in awe. The drive up the mount is not the simplest, care is needed in tight turns and if towing, turning will require a multiple point effort so do as we did and leave the caravan at the holiday park and head up for the sunrise, it is worth it. Early starts demand real coffee so after sunrise we pointed the GPS at Horsham, the regional city for the Wimmera district. A little known fact but one the area is clearly proud of is the number of times it has been named “Australia’s Tidiest Town”, including 2016. The civic pride in the city is clear and enviable. After taking our time to let the morning sun sink in over a coffee, we headed down the main streets looking for that something special. 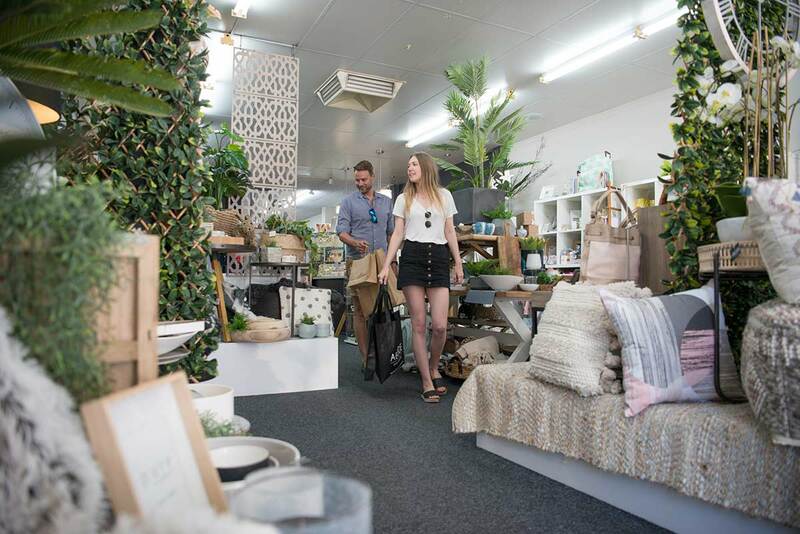 Like most regional cities, Horsham is a mix of established brands, boutique shops and local product. Art galleries and homewares are popular and worthy of some time. Although at the start of our journey, a somewhat unexpected but welcome find was Horsham Riverside Caravan Park, central to the city on the banks of the Wimmera River. An established park, it has had recent investment in amenities and rows of new cabins while its proximity to eateries had us able to leave the car in the park and not worry about limiting ourselves at dinner. If you are travelling with kids, they will love the miniature railway right outside the park gates. Check operating times online. Turning away from the national park, back towards the west, seemed counterintuitive but I had ulterior motives. To the west and slightly south of Horsham are the rolling hills of Lower Norton, famous for producing exceptional Shiraz. What drew me there was a recent release of Shiraz Rose by Barangaroo wines, a tasting, lunch and a load for the cellar before getting back on the road. This time looking to stay slightly south of Horsham to experience another of its charms, dinner at Olde Horsham Family Restaurant and Mackley Fine Art Gallery. Staying across the road at Wimmera Lakes Caravan Resort, we crossed the highway on foot (care is needed but it is passable) for a hearty meal served in an amazing set of buildings. The attitude to patrons was second to none with access to the cellar welcome and for us at least, a look through the artist’s residences backing onto the restaurant. An inspiring walk through rooms full of muse from old trams to stuffed animals and other artwork, you could feel the creativity and history. Work called but it could not have been for better reasons or be at a better location. Our next stop was for filming and testing at Best Aussie Vans and our location was Grampians Olive Co. A working manufacturer of olive oils for over 70 years, the owners were gracious enough to let us work between their groves, we could not have asked for a more picturesque location. A gentle slope gave us elevation over the basin with our backdrop the red cliffs that skirt the ranges. The grove offers more than a view, a small but well run cafe and shop sits near the entrance and the carpark has been designed with space for caravans in mind. If you do stop, you must try a tasting plate. Heading south you cannot avoid one of the most famous stretches of blacktop in Victoria, the Henty Highway. Running parallel to the national park, and clipping its edge on occasion, the drive is nothing but stunning. Heading south our necks ached from the constant desire to gaze left as the sun set against the cliffs. We had heard of a good spot to spend a night in Cherrypool, the aptly named Cherrypool Reserve. A free camp managed by the state, it has flushing toilets and picnic tables. You can try the water there, after a thorough boil or proper filtering, but bringing your own is advised. We found a waterside spot that was clearly popular with a fire mound and swing suspended from a tree. It had us thinking of a swim but for the unseasonably cold weather! If you enjoy walking with nature, there are many tracks that skirt the lake and should you bring a rod with you, there are fish to be caught. Restocking and again, chasing good coffee had us call into Cavendish. Near the southern foot of the Grampians, Cavendish is a small town with a big surprise, the Bunyip Brewery. Art deco in design with parts of the building dating back to the 1840s, the hotel doubles as a distillery and brewery and provided us and the gang from Best Aussie Vans a comfortable overnight stay. Hosting us wasn’t an issue for the staff who even threw together a signature cocktail to celebrate our event. 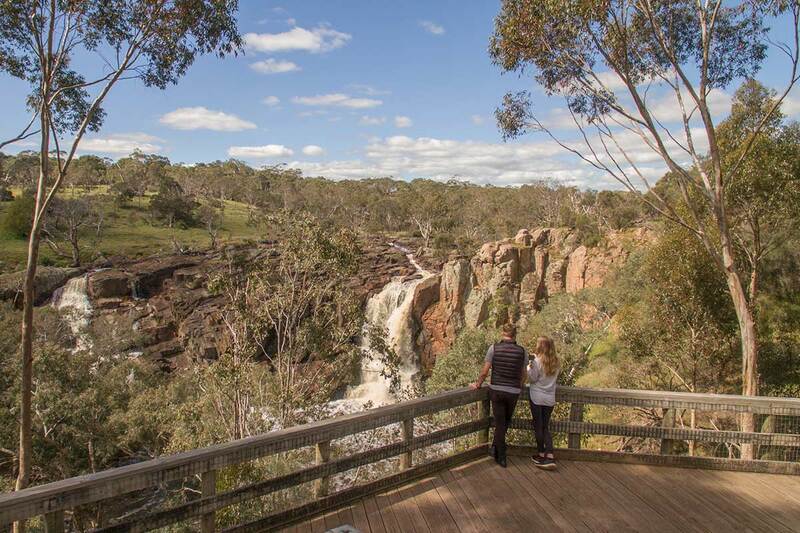 Taking some time to ourselves, we hit the popular walk that follows the Wannon River banks behind the pub. Here you can meet parrots, friendly sheep and listen to frogs and fish work for their dinners. The locals told us that should we walk downstream for a number of hours, we would come to Wannon Falls but the night was deepening and we needed refuge. Onwards to Hamilton with the plan to head back up the road to the falls in the morning. Wannon Falls surprised us, not for their beauty but that they came out of nowhere. It’s as if the land fell away in an earthquake or that a giant took a chunk with a massive ice-cream scoop, such is the scale of the fall. A solid platform allows unobstructed views and with barbecues and plenty of parking, it is a good spot to stop for lunch but some take it further. We stopped to talk to other caravanners in the area and found out there is a nearby free camping spot perfect for vans, they weren’t lying as shortly before the sun started setting we were surrounded by caravans of all ages and sizes looking for a quiet night’s rest. Heading further south to Hamilton, we chose to stay at Lake Hamilton Motor Village & Caravan Park where the rest of Best Aussie Vans showcase were staying. Central to the city, the park has a loyal following of repeat customers and solid amenities best of all a pool. Hamilton is famous for a few things but one that stands out to me is famous-son Sir Reginald Ansett and the museum that celebrates his life. The museum’s curators are second to none. We were lucky enough to get a little something extra in a guided tour, though the enthusiasm in every story tells me any willing ear will get the same loving privilege. Reading about Regi’s exploits kept a smile on my face the entire time we visited. His attitude to authority and entrepreneurship have a real Aussie feel to them. A day done and we were to wake to the showcase, a public viewing of Best Aussie Vans, held next door to the museum. 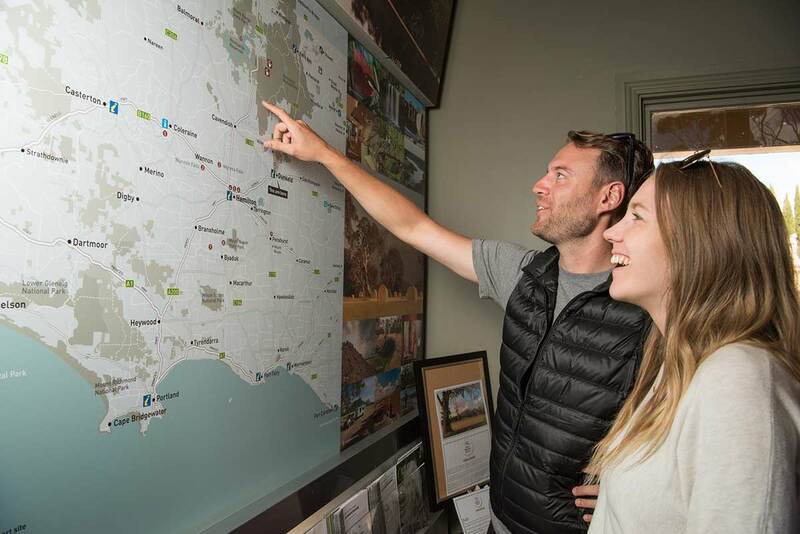 The showcase went extremely well with locals and visitors from as far as Melbourne taking the chance to quiz manufacturers and see the latest and greatest innovations in caravanning. Not a full-day affair, the idea was sprung to see another museum, this one Campe’s Motor Museum after lunch had been consumed. Campe’s is an organic, living museum in that the bulk of what is on display is still privately owned by locals and enthusiasts. It was fun to walk the aisles debating which car we would take to the beach (a convertible Citroen won) and which would live in our garages (a 1957 Oval window Beetle took that gong) but just as fun was climbing through the antique motorhome that takes pride of place along the southern wall of the building. Seeing how someone lived a life on the road generations before had us appreciate how easy our Mitsi and Titan combo really was. Having the full BAV contingent with us meant dining on a grand scale so the call was made to the Comfort Inn’s Botanical Dining and Bar. Not the usual place I would expect good meals but the inn surprised us with fast and tasty fare for our hungry lot. Awake early we were off to one of the most popular and well-known landmarks in the west, Mount Sturgeon Homestead. Once derelict, the Homestead and surrounding stables and workmans’ cottages have been restored and modernised for use as Bed and Breakfast accommodation as well as for functions. 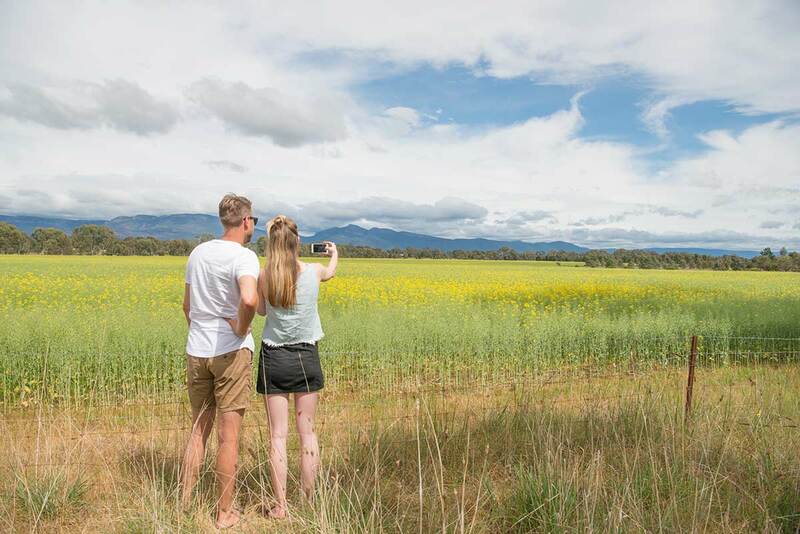 It’s easy to see why the property is so popular with weddings and romantic getaways; from a small plateau, the view to the foot of the Grampians feels familiar is the reason why, it is one of the most commonly photographed and painted views in Victoria. There is room for caravans and motorhomes but best to call ahead to ensure you do not upset any romantics with where you park. Unfortunately for us the weather wasn’t perfect like the days before so we missed our view of the peak of Mount Sturgeon but nonetheless, a long day had us in need of something special. 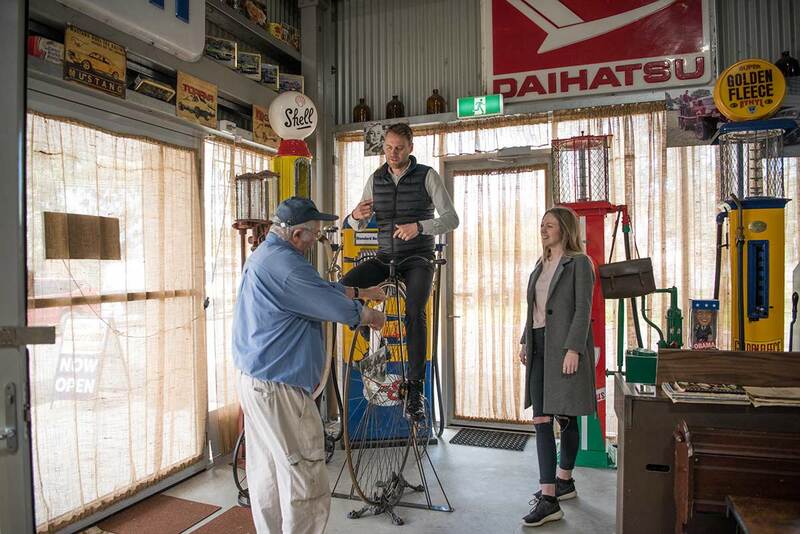 The call was made to celebrate the day through two of the south’s best, Mumbler Bar in Horsham and the Royal Mail Hotel in Dunkeld. Mumbler is a bright and lively bar popular with the locals and central to Hamilton. A pre-dinner aperitif and chat with the friendly locals had us running late for our early dinner date at the Royal Mail so the Titan caravan was left in Hamilton while we darted the 30km up the road. The Royal Mail is widely regarded as one of the finest restaurants in Victoria, some even considering it with the best nationally. To get a table we were exceptionally lucky but opting for an early seating helps. If you are planning your trip through the south of the Grampians and enjoy fine dining, a booking at The Royal Mail is essential. Coming from marine publishing Tim now oversees Caravan World and Trade-a-Boat for the Adventures Group as their Senior Editor. With experience garnered from travelling the breadth and width of his home country New Zealand in all manner of ways, his mission is to see all Australia has to offer. Having already sampled Cape York, Murray-Sunset National Park, Wilsons Promontory and the bulk of Victoria’s West, he has plans to add to the small parts of WA and NT already seen. 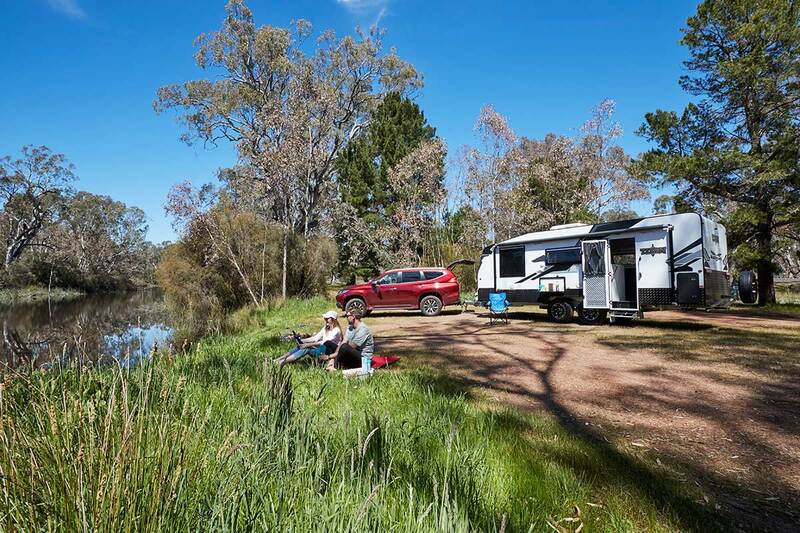 When not on the road you can find Tim passing time at lakes around Australia or in the high country camping with his close friends and family with the Murrindindi a popular spot.